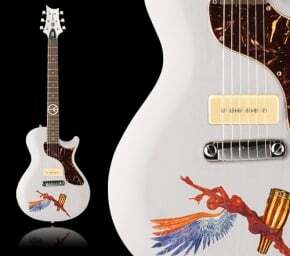 Paul Reed Smith has spent more than two decades building the kind of guitars many of us dream of owning. From concept and design to fit and finish, PRS has a reputation as one of the best in the business and has attracted legions of fans who love their instruments. The PRS Sunburst 245 is no exception. The Sunburst simply reeks of class as soon as the case is opened. It features an extra-thick mahogany back, a figured maple top, a 22-fret mahogany neck built to a 24.5-inch scale and wide/fat neck profile, and a rosewood fingerboard with bird inlays. It also ships stock with a PRS hardtail bridge/tailpiece, vintage-style tuners, and two 57/08 humbucking pickups which give the guitar excellent tone and clarity. The 245 is finished in nitrocellulose, which is the finest finish for a guitar, and it is also outfitted with two volume and tone controls as well as a three-way toggle switch on the upper bout of the body, which is where the pickup switch truly belongs on a guitar of this type. The Sunburst 245 is an instant fit for players who are used to the old-school single-cutaway guitars of days past. The highly sought-after 57/08 pickups give the guitar a voice that is fresh yet familiar and are perfect for live gigging and recording. As per usual with Paul Reed Smith, those who have already bought these seem to love them and customer loyalty remains high. The Sunburst 245 seems suited for blues and classic rock, but will do an excellent job for whatever a player can dream up. Indications are that the Sunburst 245 will maintain an important place in the Paul Reed Smith product line and, more importantly, will give those who purchase one the right tool they need to get their gigs done night after night.